Hello listeners, what’s your boggle? We wouldn’t normally try to conjure up the image of a painted wall with the episode title, but we were somewhat shambolic this week, even by our own standards. With host Steve Norman suffering from agonising tooth ache during much of the recording, Owen Hughes and guests Andrew Brooker and Tony Black ran amok. A new round of the quiz kicked the show off, pitting Steve against Brooker and Tony, with Owen in the quizmaster’s chair, before the group discussed the potential Fantastic Four sequel and latest Assassins Creed trailer. As ever, What We’ve Been Watching followed, as Owen revisited 90’s classic Demolition Man, Brooker spread the love for recently cancelled sitcom Undateable, and Tony returned to Superman.. er… Returns. Only two new releases made their way onto the podcast. 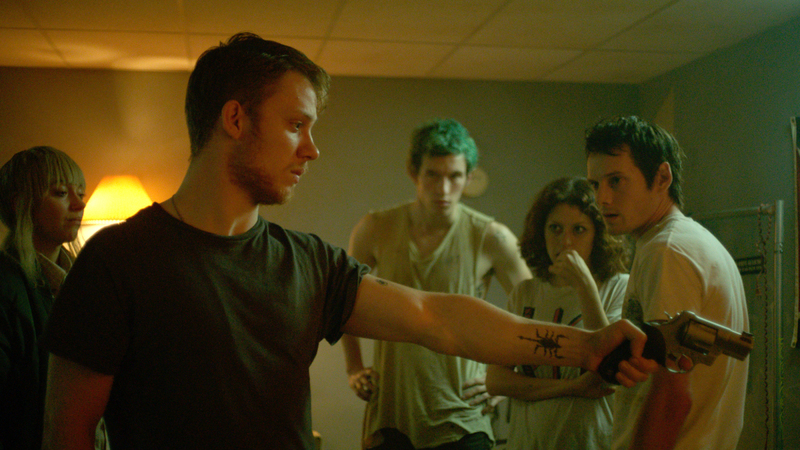 Brutal thriller Green Room was the main feature, but as penance for not seeing anything at all in the last seven days, Steve still attempted to review The Angry Birds Movie without having watched a single second of it. Luckily Brooker had seen it and was able to clarify a few minor points!